A serious of explosions rocked, 15 minutes apart, the town of Reyhanli, Turkey. Two mined cars blew up near the Town Hall and in the industrial area, killing 45 and wounding over 100 people. An event like this is not a novelty for Turkey – this used to happen before, but this time the explosions may have far-reaching political and even geo-strategic consequences. A tense situation in this part of the Middle East – in the light of a likely Israeli air raid on Syria – may gradually throw the region into the chaos of a full-scale war. 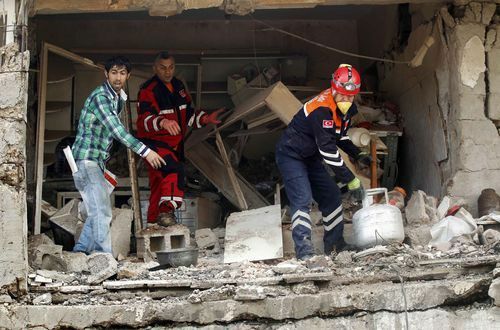 Just hours after the blasts, Turkish Vice-Premier Bulent Arinc said he did not rule out the involvement of Syrian authorities in the organization of the terrorist attack aimed at forcing a large number of Syrian refugees to leave their country. Taking into account that Syrian refugees account for almost a third – 20-25 thousand – of Reyhanli’s population, this should not be ruled out. Turkey’s Prime Minister Tayyip Erdogan has noted that such a powerful inflow of refugees from a neighboring country has long been causing resentment among the local population, which contributes to further tension in the town. The newspaper Hurriyet quotes Turkish Deputy Prime Minister Besir Atalay as saying that nine people were arrested on suspicion of masterminding and carrying out the explosions. This gave rise to new claims about the involvement of Syrian secret services in the terrorist attack. Naturally, logic and common sense not always hold sway in political actions. From this viewpoint, Damascus needs no further aggravation of the already tense relations with Ankara. Besides, a war with Israel may break out at any moment, and fighting in three directions would be suicidal for the Syrian government – in any case against an enemy like Israel. But there are also counterarguments to this logical conclusion. Syrian President Bashar al-Assad is extremely interested in rocking Turkey’s domestic political boat and at least trying to divert Ankara from Syrian affairs. And Damascus has such a strong bargaining chip here as Kurdish problem. The Turkish government has made quite an effort lately to reconcile itself with the Kurds, prompting them to drop armed struggle in favor of political negotiations. The Turkish Kurds’ leader Abdullah Ocalan, now serving a prison term, has called for ceasing armed fighting. By all accounts, his call was heeded. According to Kurdistan Workers Party (PKK) sources, the Kurdish insurgents are withdrawing their units from the Turkish territory. The Kurdish situation, particularly in Syria, is reaching a deadlock – it is not confined to that country only. The Assad government has always pursued a policy of ethnic discrimination towards the Syrian Kurds. At the same time, some sources claim that Damascus supports Kurdish separatist movements, including the PKK. The Syrian Kurds are not exactly rushing to back the opposition that is fighting the Assad regime. In late December 2012, after representatives of the National Coalition for Syrian Revolutionary and Opposition Forces had conducted a number of talks on the inclusion of Syrian Kurds into the opposition, the Kurds themselves announced that they had not yet decided whether to join this coalition. The Kurdish leaders managed to iron out their differences and draw up a joint program of actions. The Syrian Kurds’ political parties and movements formed a united Higher Kurdish Council that represents Kurds on the national and international levels. The council’s main demands are as follows: granting the same political, social and cultural rights that the Arabs enjoy now, putting an end to ethnic-based discrimination, and establishing a broad-based Kurdish autonomy of the Iraqi Kurdistan type. The Kurds are now setting up governmental bodies on the territories they control, which may turn later into the authorities of an autonomous region. In the cross-border areas now under Kurdish control, self-defense units are guarding the Turkish-Syrian border, hindering the penetration of armed mercenaries, and cutting off the channels of arms supply from Turkey to the Syrian opposition. These actions provoke armed clashes between the Kurdish militia and the Free Syrian Army supported by Turkey. This face-off is expected to intensify in the course of time because the power-thirsty opposition is unlikely to resign itself to the loss of control over a part of the Syrian territory and will try to foil this in any possible way. The Kurdish problem in Syria may have a serious impact on regional developments. In early 2012, Arbil, the capital of Iraqi Kurdistan, hosted a conference of Syria’s opposition organizations, which resolved that “after the overthrow of the Assad regime, Kurdish self-government is to be established in north-eastern Syria.” In the spring, the Syrian Kurds proclaimed an autonomous entity called Western Kurdistan with Afrin as capital in northern Syria, which borders on Turkey. No matter who stands behind the Reyhanli blasts, this terrorist attack will increase a tendency towards disintegration of Middle Eastern states and an essential repartition of borders. The civil war in Syria will end sooner or later, and it will be rather difficult to restore the country within the original borders. The Syrian Kurds will never agree to be second-rate people and will at best insist on broad-based autonomy, as is the case in, for example, Iraqi Kurdistan. In the medium term, this may become a prologue for the establishment of a new Kurdish state that ranges from the Mediterranean to the Caspian Sea. This tectonic geopolitical fault line may have global-scale unpredictable consequences. It is next to impossible to prevent this, and the only goal is to alleviate the consequences. Stopping the civil war in Syria could be the first step in this direction. But, at the moment, neither of the sides shows any signs of common sense.